The Emperor Motion Picture, Bona Film Group released modern war epic OPERATION RED SEA in 11 short days during the Spring Festival period made over 2.3 billion yuan in the Mainland. 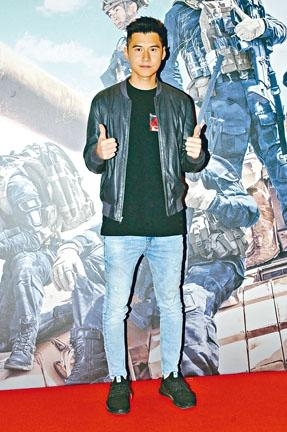 Emperor yesterday held a celebration and Hong Kong premiere. 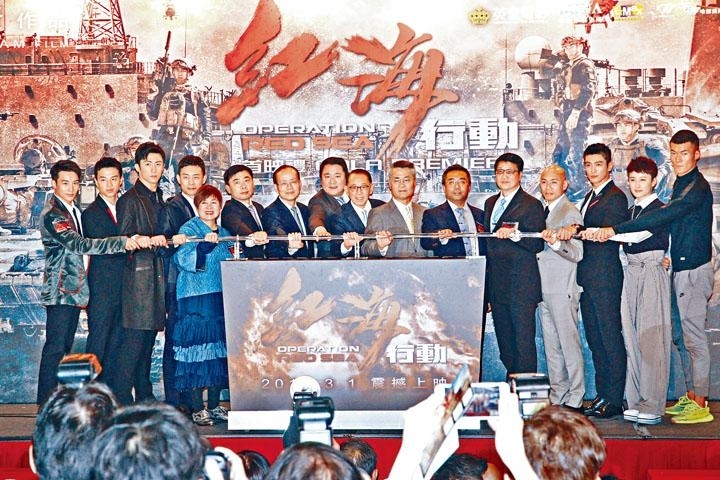 As OPERATION RED SEA headed toward 4 billion yuan RMB at the box office, boss Albert Yeung Sau Sing first had to thank "Devil Director" Dante Lam Chiu Yin. He called him the soul of the film and praised his willingness to take risk at work. Even if he would ask for a bonus, Mr. Yeung would feel he would deserve it! Yesterday at the OPERATION RED SEA premiere were Emperor group chief Dr. Yeung Sau Sing, Bona film group founder and CEO Yu Dong, RED director Lam Chiu Yin, producer Leung Fung Ying, actors Zhang Yi, Huang Jingyu, Du Jiang, Jiang Luxia, Wang Yutian, Yin Fang, Henry Mak, Jacky Cai Jie, Huang Fenfen. 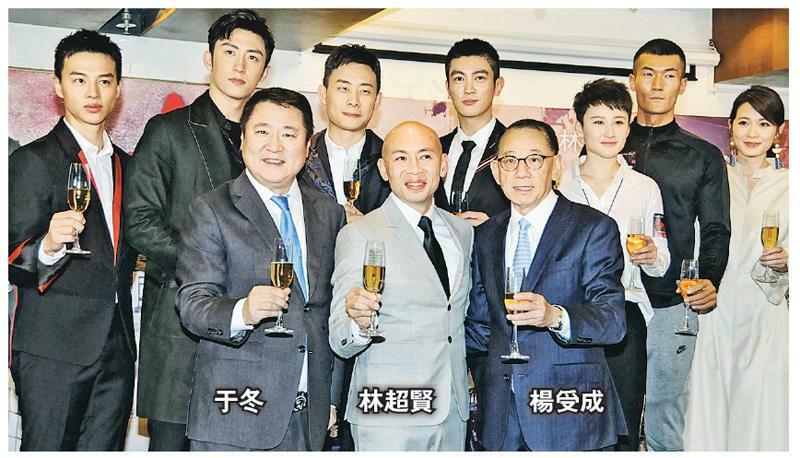 Guests included director Andrew Lau Wai Keung, Michelle Wai Sze Nga, Carlos Chan Ka Lok, Kathy Yuen (Tong Yi), Deep Ng Ho Hong, Money Lo Man Yi and her husband Suen King On. OPERATION RED SEA already made over 2.3 billion at the Mainland box office. A ice sculpture of the number 23 was at the celebration for the ice breaking ceremony as well as a champagne toast for the film to continue to reach new heights at the box office as it headed toward 4 billion RMB. In Hong Kong the film will officially open on March 1st. Yeung Sau Sing said, "OPERATION RED SEA has been a box office hit in the Mainland and also received good reviews across the board. I have been very fortunate to invest in this film. I thank boss Yu Dong for working with me, at the same time I first have to thank director Lam Chiu Yin. He is the soul of the film. For this 'Devil Director's' productions bruises and scraps, broken bones and hospitalizations are inevitable. Even though working on his film is very tough, many actors want to offer their services. The film is about the Chinese navy. This time we received the Moroccan military's assistance with the military equipment shoot. I hope everyone can sense the sincerity of the production and at the same time feel the beautiful feeling of the nation's strength. I hope the box office will continue to climb." Yu Dong thanked boss Yeung Sau Sing and director Lam Chiu Yin. The film production took 9 months, from the Lunar New Year's Day release to the Lunar 11th its box office reached 2.3 billion yuan RMB -- doubling Lam Chiu Yin's previous film OPERATION MEKONG and its 1.1 billion take as it hoped to head toward 4 billion. Yeung Sau Sing said, "I am very pleased with the current performance. I believe it will pass 3 billion this Sunday and definitely will have a chance at 3.5 billion." As for its category III rating, Mr. Yeung stated that it probably will affect the box office. However this film is rather attractive, with all the stimulations and gore the category III rating was expected. Lam Chiu Yin said that his "Devil Director" nicknamed was Mr. Yeung forced. Mr. Yeung joked, "That's right, I constantly rushed him. He takes a lot of risks at work. Earlier in Morocco he was injured and bleeding when shooting a car chase. Just like Jackie Chan's last injury I thought he was going to die. With the film's success, Lam Chiu Yin has asked for a bonus. If Yu Dong agrees then I feel he deserves it. This movie indeed has made a lot of money." Finally he revealed that Emperor Motion Pictures in June or July will release the Chow Yun Fat and Aaron Kwok Fu Sing starred PROJECT GUTENBERG (MO SEUNG). Next month it will start production on another new film by director Alan Mak Siu Fai with stars Karena Lam Ka Yun, Nick Cheung Ka Fai and Sean Lau Ching wan. Nicknamed "Devil Director", Lam Chiu Yin said, "Everyone is just joking around. This name came from Cheung Ka Fai." With the success of the film, Lam Chiu Yin felt that asking for a bonus was very normal. "I have slaved away like a mule for so many years, the money saved would be like a pension." He also revealed how he was injured. "During the shoot I am used to walking around. That day on the Jeep I was responsible for driving and giving directions with a gun. After the shoot on the way back I turned too fast and flipped the vehicle. The female assistant director in the vehicle injured her face on the gun in my hand and I busted my head open. I immediately looked for the emergency medical treatment for the female assistant director. In order to avoid affecting the progress of the shoot I stopped the bleeding and kept working. Only after I returned to Hong Kong did I realize that I had fractured dislocation and had to continue treatment. (Would you be more careful from now on?) That's how my personality is, an action film production has to be charge ahead to be entertaining." Playing the captain in the film, Zhang Yi felt that Hong Kong friends were very loving, very understanding and very supportive of film. With his military experience he stated that Director Lam was especially demanding of him. As for being the "Devil Director", he agreed. "That's right, he is strict with actors just as he is strict with himself. He is also very demanding. During the shoot he takes a lot of risks. He flipped his car and was hurt. His head was busted open, I was scared silly but he insisted on keeping shooting." Huang Jingyu was elated with the box office success and hoped that everyone would continue to pay attention and recognize the film. As for injury during the shoot, he said, "A lot of explosion scenes left a lot of 'remains', so they were very dangerous. After each time I had a few more wounds. I have studied Jujutsu, and my left leg and kneecap would easily swell from crawling too hard." As for the "Devil Director" title of Lam Chiu Yin, Huang Jingyu felt that he was not mean at all. He was very even tempered when he spoke, he was just serious at work and very demanding of each shot. He wanted the best. "Maybe in the eyes of others he is very exaggerated, I think he is fine. Only from being serious would good movies be made, and actors would give spot on performances." Wai Sze Nga and Chan Ka Lok attended the premiere. Sze Nga has not had the chance to work with director Lam Chiu Yin, but he reminded her of something memorable. "When I first got into the business, I attended a party and my back caught fire. At the time Chan Ka Lok picked up a seemingly alcoholic beverage and wanted to pour it on the fire to put it out. At the time I calmly stopped him. Later after Lam Chiu Yin found out he praised my agility and would like to work with me in the future. Unfortunately he hasn't so far, so later when I have a chance I would remind him again. Don't let my appearance fool you, actually I really want to try war films with guns."